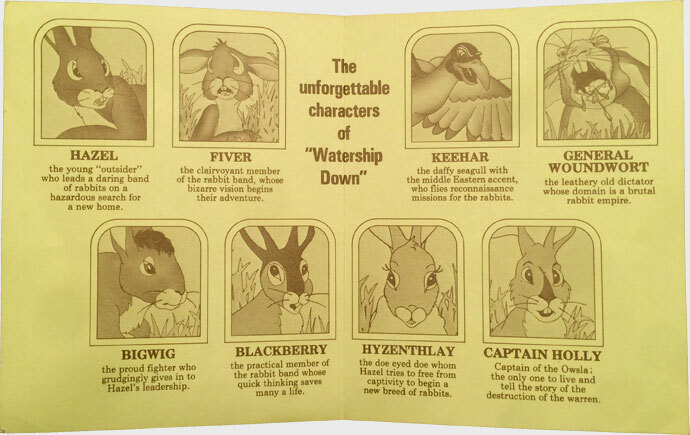 This is an original promo pamphlet distributed at some theaters during early showings of the 1978 animated film Watership Down, based on the fantasy adventure novel by English author Richard Adams, first published in 1972. The program front cover features background artwork from the film, with the film logo. The rear cover features an abridged version of the "Lapine Glossary" from the novel (see above). The inside features images and short descriptions of the film's main characters (see below). Bi fold heavy matte finish paper pamphlet, 4" x 5"; produced and distributed by Avco Embassy Pictures. Fine, as New, with some minor age-darkening on front cover.